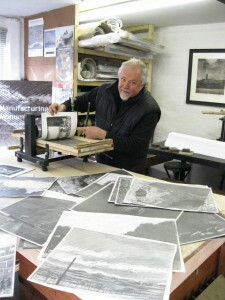 Dave Gunning is a prolific artist, renowned for his etchings and drawings of the UK’s landscapes and the worlds ancient monuments…but also he is well known for his revolutionary bespoke printing machines, enabling artists all around the world to carry on the beautiful art of printmaking. 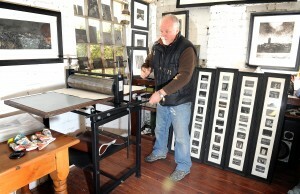 Dave’s daughters Jenny Gunning and Sarah Morris run their Art gallery and specialist printmaking studios in Ironbridge, Shropshire where Dave, Jenny and Sarahs work is on permanent display. At the age of 14, artist Dave Gunning was accepted into the royal academy. Now his work is so popular he has no idea how many exhibitions he has running at any one time. He talks to Shirley Tart from Shropshire Life Magazine…. You open your mouth, fishlike, when trying to take in the extent of Dave Gunning’s work and achievement. And each time you are about to ask a question, there is another list of galleries, exhibitions, commissions to pore over. The truth of the matter is, Dave doesn’t actually know how many exhibitions he has going at any one time and has had down a good number of years but thinks it’s got to be more than 70. And there can’t be too many people any-where with his intimate knowledge of the country’s art galleries and museums Indeed he was first accepted into the Royal Academy at the age of 14 and no doubt to the envy of small children everywhere, started painting with his hands – and still does. His work is in many public and private collections and includes 50 small etchings now in one of the most prestigious addresses in the land – Her Majesty’s Royal Collection. And in this her Diamond Jubilee year, Dave couldn’t be more proud of that – well not since the day it was his role to greet The Queen as she stepped from her car to open Walsall New Gallery back in 2003. And after that very successful meeting, he spent a couple of years making and refining the etchings which were eventually sent to Buckingham Palace and accepted by The Queen.…..Story by Ian Harvey click here to read the rest of the Article. Dave’s Etching presses are very easy to use and are extremely versatile, letting you print etching, dry-point, lino and wood blocks as well as collagraph’ and any surface that you etch into or build up. We offer 4 different sizes, making sure that you can choose the right size printing machine to suit you. 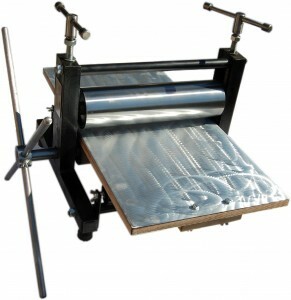 We also offer the choice of an extra long Star wheel, as well as the option to have a stand for your press, lockable wheels on your press so that you can move it around your studio easily. We can deliver and set up for you or you can collect. Full payment on order, unless you are an education body and need a pro-forma – pay by card over the phone or in the Gallery, by BACS, cheque or cash. We also have interest free credit payment plans available. There is a 6 to 8 weeks waiting list.